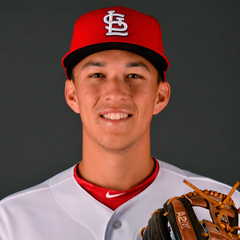 In Surprise’s Wednesday loss, Cardinals lefty pitching prospect Evan Kruczynski allowed three runs, though only two were earned due to a Tommy Edman error. The second baseman singled, doubled, scored and drove in two. Results from the game played Wednesday, November 14th. 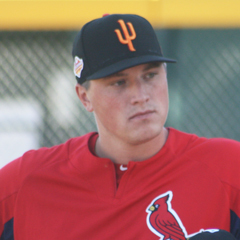 St. Louis Cardinals left-handed pitching prospect Evan Kruczynski fell prey to a poor first inning as the Saguaros (11-18) fell to the Solar Sox, 10-6 on Wednesday afternoon. All three tallies yielded by Kruczynski (L, 2-2) during his three-inning stint occurred in his initial inning of work. Three singles jammed the sacks full without an out being recorded, leaving the southpaw nowhere to put the next batter when he issued a free pass. A pop out to short invoked the infield fly rule for the first out. It looked like Kruczynski might escape with minimal damage after he induced a grounder to short but second baseman Tommy Edman’s errant throw to first resulted in only one out recorded while two runs scored. The Wisconsin native notched the first of his three strikeouts to end the frame. Kruczynski allowed six hits and two walks in all and finished his AFL stint with a 1.99 ERA. Connor Jones followed Kruczynski to the mound, pitching the fourth and fifth. Jones was tagged for an unearned run due to a passed ball while permitting a single and two walks with three K’s. St. Louis’ final hurler on the day was Will Latcham, who surrendered an eighth-inning home run and struck out the other two of his three batters faced. Runs were scored against all five Surprise pitchers on the day. Surprise banged out 13 hits, led by Pittsburgh’s Cole Tucker, who went 3-for-4 with a walk, double and run scored. Edman was one of three Saguaros with two hits each, singling and doubling in five at bats, touching home once and driving in two. Eight of nine Surprise starters garnered at least one hit, the sole exception being designated hitter Andy Young, who was hitless in five at bats out of the five hole. Young did contribute, however, by knocking in a tally.